the GB edition of dr. mario was so interchangeable with the NES version that i thought i would take a peek at another edition i had on hand, dr. mario online rx for wiiware (which, incidentally, is one of the few wiiware titles you can buy outside of nintendo’s eshop via amazon). in doing so i skipped over the SNES and N64 editions, but i was interested in checking out the new co-op and worldwide wi-fi vs. modes. the review at nintendolife.com provides a run-down of the other modes, which are mostly what you’d expect so i won’t dwell on them too much here, although i appreciated the ability to do a “hard drop” (press up to make a pill drop to the bottom, as in the modern tetris games) and the game also allows you to see the next three pills instead of just the next one. another unique feature is that you can send a demo version to friends so you can battle over wi-fi. i haven’t tried it out yet, but will def. be making use of it. the game is bright and colorful and i appreciated that it doesn’t have the maddening cheapness at the highest levels of difficulty that i mentioned in my previous post and that the viruses are distributed in a reasonable fashion. i also enjoyed the two new-to-me tracks, called “cough” and “sneeze”, which apparently were introduced in the N64 game under different monikers. the co-op mode is no doubt inspired by the version that appeared as a stylus-controlled bonus in brain age 2. like that version the game features two nice reworkings of the classic “fever” and “chill” tunes, but this game’s mode is designed to be much more fast-paced. 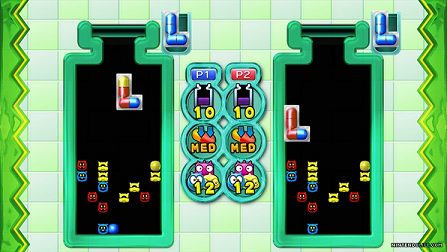 the size of the playing field is significantly smaller than the normal modes, and each stage starts off with only one pill dropping down at a time. this quickly increases to two and then three pills at a time, and then things get really hectic. the levels are designed to be short, and i played with someone who actually knew what she was doing and so we ended up alternating turns until the inevitable mad scramble that resulted when three pieces start dropping down at once. this was a fun, if somewhat shallow, diversion and one that would be even more stupid fun with more people. the wi-fi mode serves as yet another reminder that my video game skillz are sorely lacking when compared to the rest of the world. this shouldn’t be that surprising, since according to the nintendo channel data the average owner of the game has played it for more than 26 hours (now up to more than 27). as with the game boy game, this has motivated me to spend more time mastering the combo system, but i’m going to have to come back to that since for now i think i’ve had my fill of dr. mario madness. 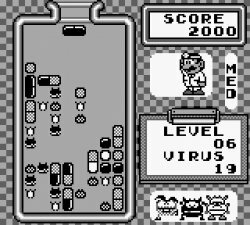 – as with other games in the series there’s an ending after beating the highest difficulty at level 20. in this case the credits roll and you see viruses and mario floating around in what is presumably some sort of petri dish. it had been a few years since i’d played dr. mario on NES. the next entry in the series was the version on GB which was released just a couple of months after its older brother. when i’d played the NES version i’d been somewhat bored by how limited the combo system was compared to classics like puzzle league, but this time around i spent more time trying to make more-involved combos, in part because you get a familiar little bonus riff if you clear a certain number of pieces at once. the combo system has turned out to be much more interesting than i’d originally thought, and i was more struck by the considerations of matching both horizontally and vertically than the first time around, although this rendition of the game itself didn’t grab me enough for me to want to invest a whole lot of time mastering the ins and outs of it. the presentation is perfectly fine for a game boy game, in terms of the graphics and sound, but the number of options is quite minimal, pretty much just your basic solo and vs. modes. i beat level 20 on the medium difficulty, but the higher levels of the high difficulty setting were incredibly cheap. i didn’t mention this in my previous post on the NES version, but as with that game at these levels the viruses are stacked so high that it really feels like it’s just a matter of luck whether or not you’ll be able to get the stack down to a point where you can actually just play the game instead of scrambling blindly. 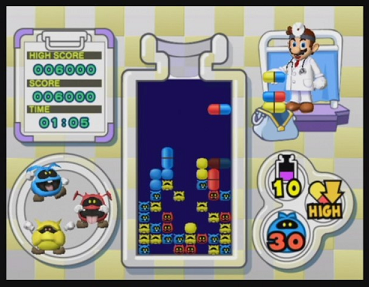 i don’t doubt that there are some dr. mario masters out there who can pwn even this level of difficulty, but for the average player it just feels unfair. not much more to add. the game is a good portable version of the original NES classic, but with a host of modern alternatives this is a game that can be skipped over except by the most OCD of nintendo fans (like me) or those who have the nostalgia factor to contend with.